Being one of the most famous tourist destination in the world and the bridge between Asia and Europe, you will find a wide selection of hotels available in Istanbul. One of the best places to stay in Istanbul is at the Sultanahmet District where you can be in the middle of all the tourist buzz and just minutes away from key attractions e.g. the Blue Mosque – its also over here where you can competitively priced food and souvenirs. 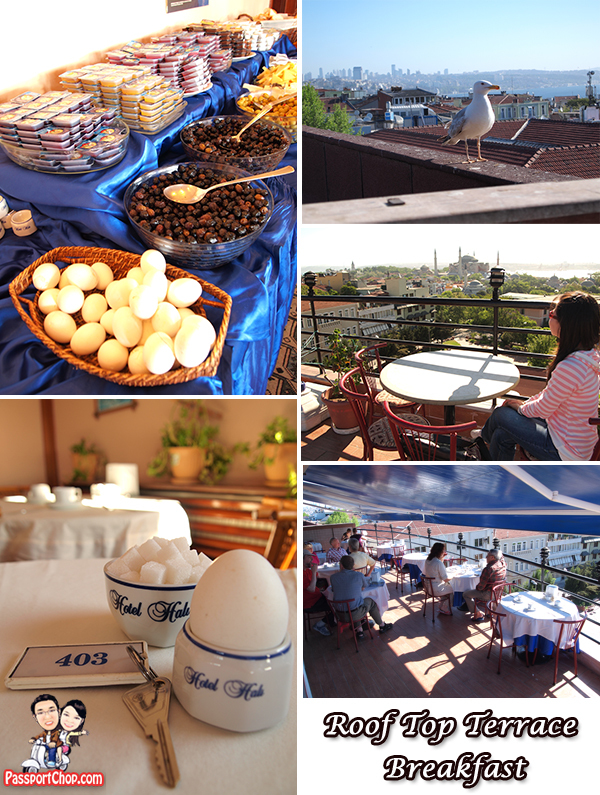 Located just 5-8 minutes away from the Sultanahmet tram station is Hotel Hali – a 3-star hotel with a good rooftop terrace view of the Red/Blue mosque and the Bosphorous Sea. There is a very very small lift (can fit in 2 persons with 2 luggages just nice) which is convenient especially for those staying at the 4th floor or going to the terrace rooftop for breakfast. Amenities are basic – for €65/night, you get a double room (although ours come with 3 single beds) with attached bathroom. Unfortunately, the room feels a bit musty but manageable – the air-conditioning can get quite cold but at least its working. TV is very small with very limited channels – you get the CNN and BBC news here. 🙂 The location is unparalleled – Blue Mosque is abt 10 minutes walk away and there are many restaurants just across the street. The Grand Bazaar is a comfortable 15 minutes walk away (great for a quick afternoon nap after an exhausting morning shopping). Many hotels in Istanbul have the same sales pitch “terrace views of Red/Blue mosque or the Bosphorus Sea” and Hali Hotel doesn’t disappoint in this aspect. The breakfast served is continental-style – cheese, ham, bread, hard-boiled egg, butter and jam with orange juice or just plain water. Don’t leave your food unattended if you are sitting outside or you could be sharing it with one of the many seagulls flying overhead. There is in-room Wi-Fi and also at the rooftop terrace so you can have your breakfast, enjoy the view and blog/surf the net. However it can get quite windy and cold at times. 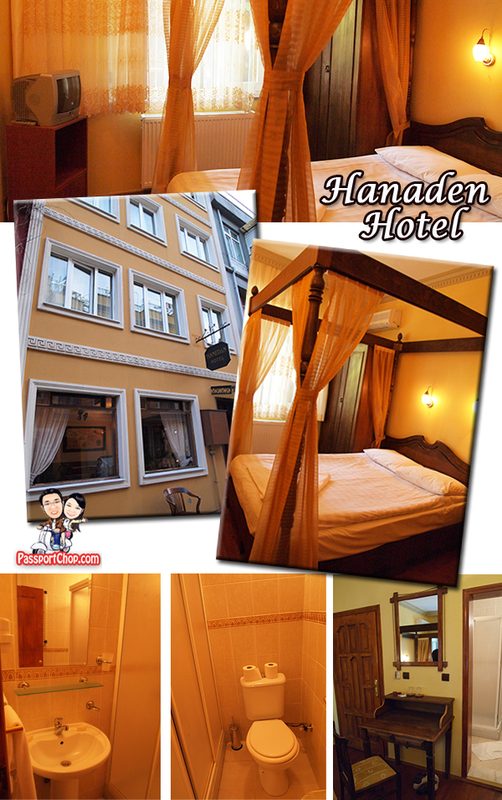 After 12 days going around Istanbul, we returned to a different hotel in Istanbul – Hotel Hanedan. Hotel Hanedan (€50/night) is located in Sultanahmet as well but in a backpacker district; more youthful bustling neighbourhood – unfortunately things are slightly more expensive too. We got a double room with a poster bed – looks quite cool; however there isn’t any lift. Luckily our room was only on the second floor. Like Hali Hotel, amenities were basic but the room here was cleaner; although the air-conditioning was acting up weirdly at night (making very weird noises) – just take out your room key from the main switch and it will be resetted and everything will be back to normal. Its right across the Peninsula Hotel and both of the staff seemed to know each other quite well. There is supposed to be in-room Wi-Fi; unfortunately it wasn’t working then and we had to tap on the other hotel’s Wi-Fi on the ground floor. 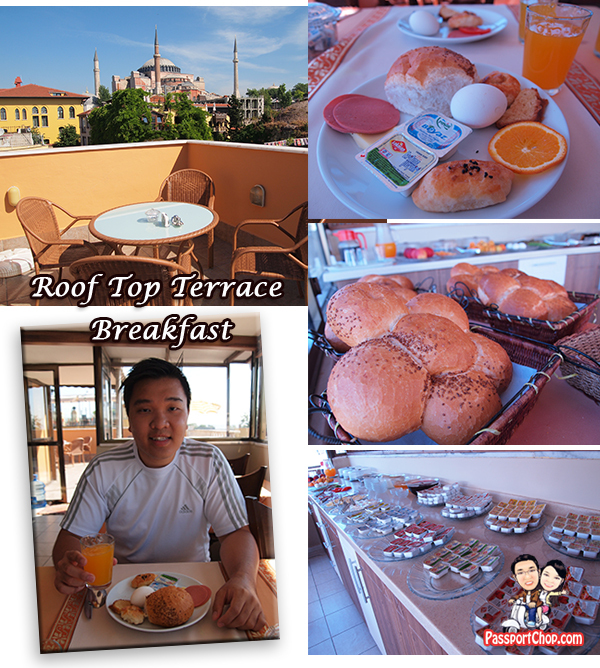 Just like Hali Hotel, breakfast was continental-style – the usual bread and butter combination with a very nice view of the Red Mosque. No lifts here so you have to make your way up a few flights of stairs to the level 5 for your breakfast – a good exercise before and after breakfast? Both are looks like worthwhile place to stay. Thanks for sharing this information with us! I didn’t stay there before; actually we love Italian and American foods. So, I have a wondered that can we get there our favorite food’s variety? Geeat view given here about website so that visitors can visit this hotel easily & also can find it easily..